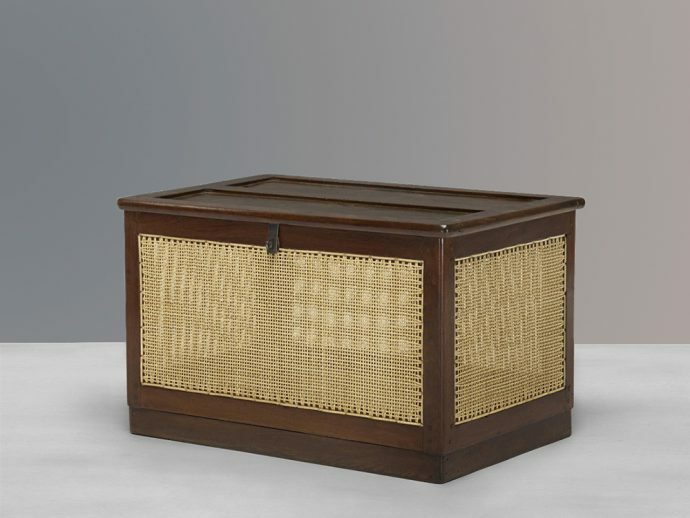 Dirty linen basket of Pierre Jeanneret is a object for putting objects in it. A fantastic piece of design. Simple for dirty laundry box. Pierre Jeanneret for home and for design. done in wood and rattan. fantastic piece of design. Very popular here and the bathroom is than ready for objects like this. Architectural piece of house and brush and pick up the best of it. The news of Pierre Jeanneret and Le Corbusier changed a lot of it. That means that Design and Architecture un the museums got important. Sell it for buyers. A special offer for collectors and auctioneers. The 1950 were important for that Dirty linen basket. Now it is a furniture people, perfect for your life-style. What I like is the aspect of making objects in teck and cane. India is an Indian style of great news. Your great style of architectural design and clear shapes. One moment to consider of being rare and fine.